Indianapolis, IN, April 12, 2019 --(PR.com)-- Attention Ladies, The National Institute for Fitness and Sport (NIFS), Women’s Triathlon Training Program prepares you for the Go Girl Triathlon at Eagle Creek Park on August 17th. Training is every week on Tuesdays or Thursdays from 5:30-7:00pm starting June 11th at the National Institute for Fitness and Sport (NIFS) in downtown Indianapolis. Whether you are new to triathlons or have done a few in the past, the NIFS training program offers three different skill level training plans to ensure that you are training appropriately for the race. Their USAT Certified coaches and fitness specialists at NIFS have developed this tri-training program to help you train the right way. This 10-week program meets at NIFS, the IU Natatorium and Eagle Creek Park to complete a weekly workout of running, biking, swimming, or a combination of the disciplines. 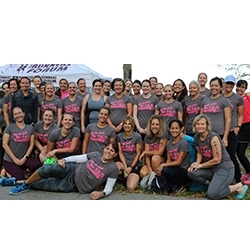 The program includes race entry into the Go Girl Triathlon, detailed training plan, a program t-shirt, weekly snacks and refreshments, and a post-race celebration. You will choose a Tuesday or Thursday training day when you register. Past participant, Andrea, said this about her experience, “I felt this program offered an amazing experience and provided invaluable training. Even on the day of the event they were there marking our bike racks with chalk, making sure we were all set, answering last minute questions, and cheering for us on the sidelines. The camaraderie amongst the group is what kept me motivated the entire time! Couldn’t have done it without them!" To register, or for more information regarding the NIFS Tri-Training Program, call Kris Simpson at (317) 274-3432, ext. 211 or visit www.nifs.org to register online. Early bird rates run from April 15-May 15, 2019. NIFS media contact, Trudy Coler (317) 274-3432, email tcoler@nifs.org. National Institute for Fitness and Sport is a non-profit organization committed to enhancing human health, physical fitness and athletic performance through research, education and service.